We love to go on cruises, and try to do so every few months. and an explanation of what we love about cruising! 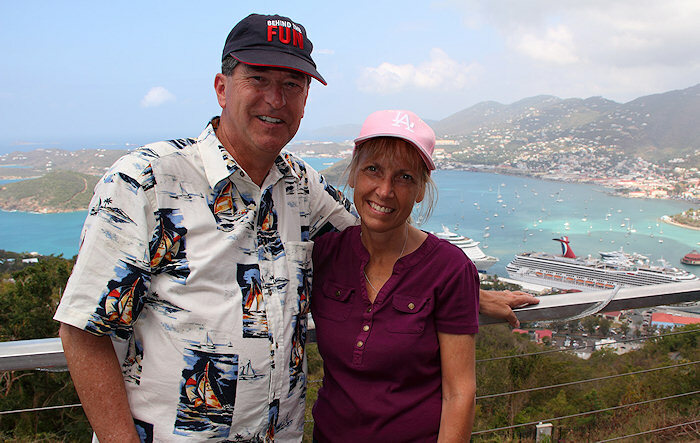 at the Paradise Point overlook in St. Thomas, in the U.S. Virgin Islands. Here's a little video I put together that pretty much sums up in three minutes what's so great about cruising! I'm a photography nut, and usually bring my Canon DSLR and a tripod with me when we cruise. Please note: The photos and videos on this page are my original creations, and none are stock photos supplied by the cruise lines. For information about the camera used to shoot both the still photos and the videos, click here. 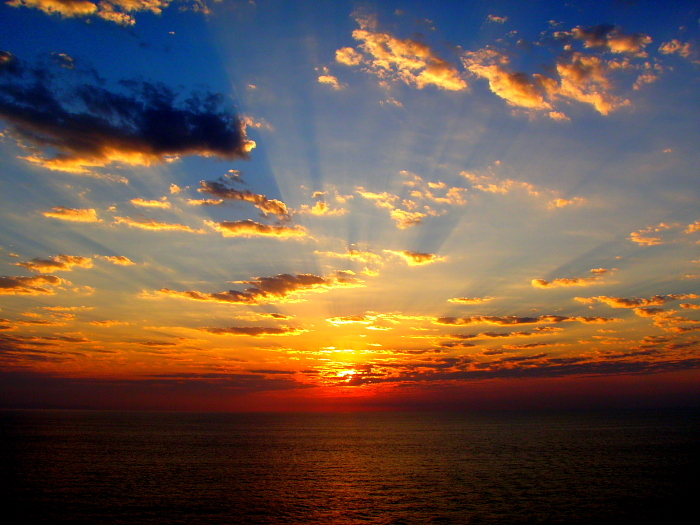 I'm an early riser, so I've seen quite a few spectacular sunrises from the deck of a cruise ship! This photo was taken in the Caribbean during our cruise on the Carnival Freedom. More pictures from our this cruise, including many more sunrise & sunset pictures, are here. We visited here in May of 2014. See more pictures from this cruise here. at Royal Caribbean's private beach in Haiti. More pictures from our November 2014 cruise on Allure Of The Seas are here. Of the hundreds of photos I took on our Alaska cruise, this was my favorite. Night shot of one of three swimming pools on the Carnival Spirit. More pictures from the Carnival Spirit are here. This photo was taken off the west coast of Mexico, during a cruise on the Carnival Spirit. The best cruise we've ever been on was a 14-day cruise on the Carnival Breeze. It's the newest ship in the Carnival fleet, and the most beautiful. While sailing out of the port of Miami on the Carnival Breeze, I looked back and saw this beautiful sight. 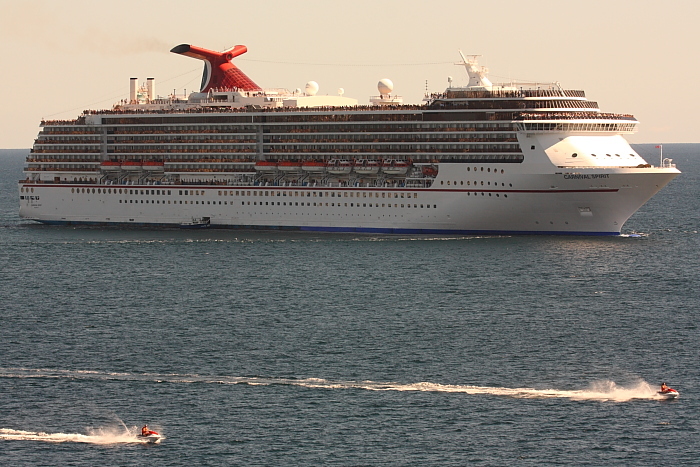 We were being followed out to sea by the Carnival Glory. 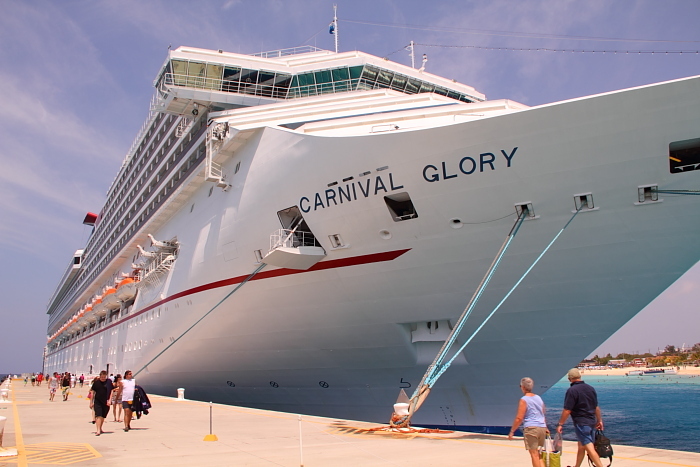 More pictures of the Carnival Glory can be found here. Besides the three in the foreground, can you spot the two other cruise ships in this photo? The Disney Dream and Holland America's Eurodam are barely visible in the upper left. They are docked facing away from the camera, so all you can see is their aft ends. 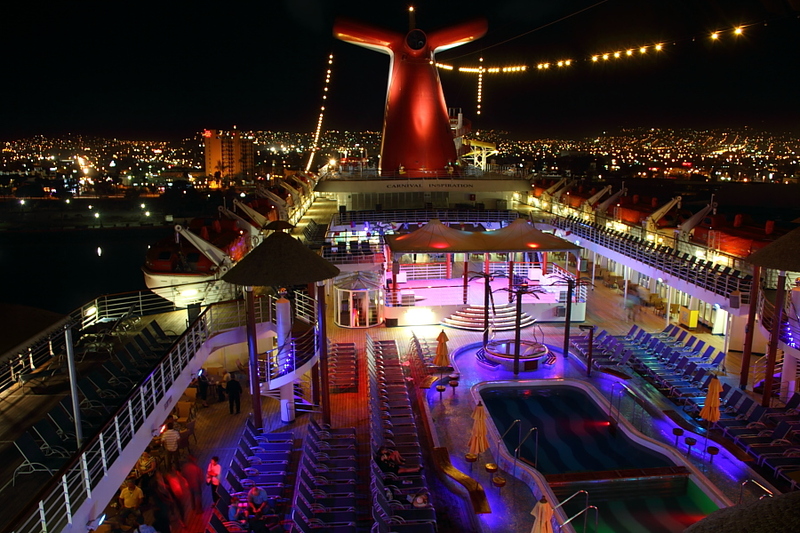 Night shot of the Lido deck on the Carnival Inspiration. The secret to getting this kind of photo is to bring a tripod onboard with you and to do a long exposure. 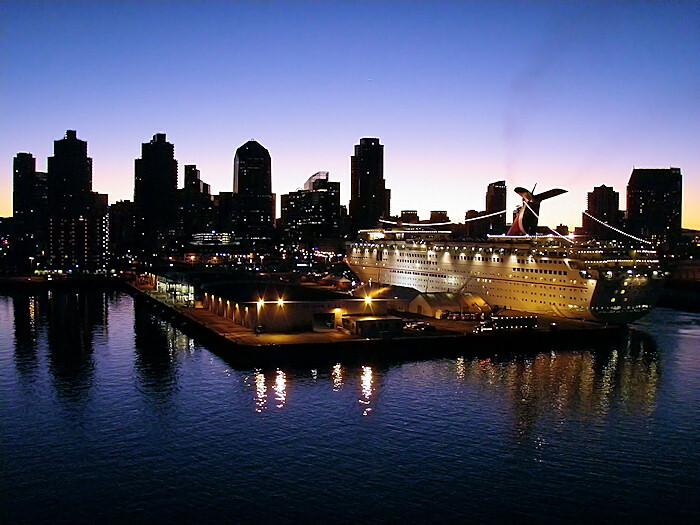 I snapped this photo of the Carnival Elation docked in San Diego while I was on the deck of the Carnival Spirit. We were returning to San Diego after an 8-day cruise on the Spirit. 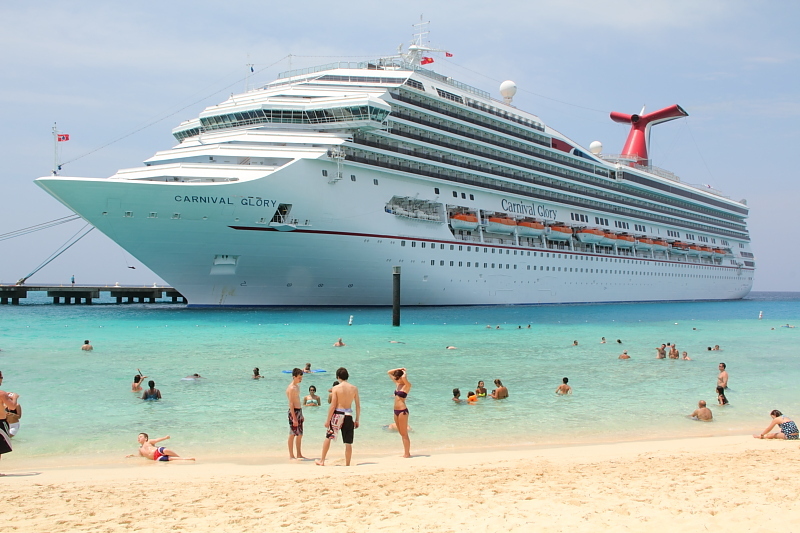 The Carnival Glory docked at Grand Turk, in the Turks & Caicos islands. Carnival corporation spent a lot of money building their own pier and developing a shopping/restaurant complex here. It's really great! The best part is the largest "Margaritaville" in Jimmy Buffet's chain of restaurants. 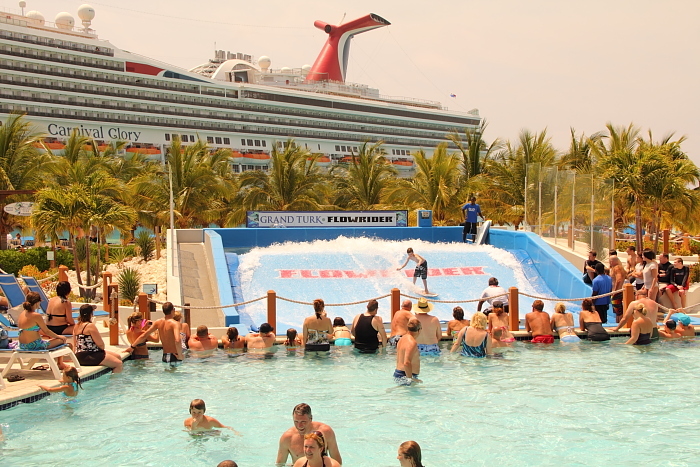 The "FlowRider" surfing simulator at the Margaritaville next to Carnival's dock in Grand Turk. I shot some great video of people wiping out on the FlowRider. Click here to see the video. 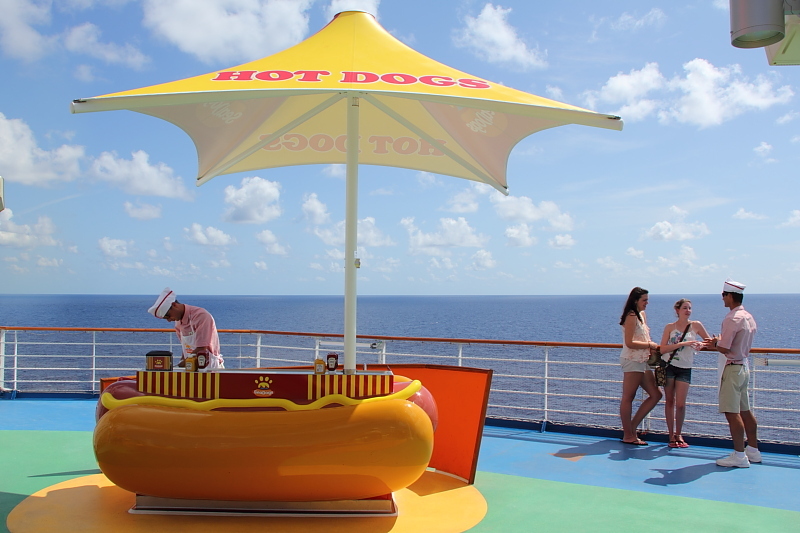 The hot dog stand up on the sports deck on the Carnival Magic. If you'd like to see a lot more pictures I shot on the Carnival Magic, take a look at this page. 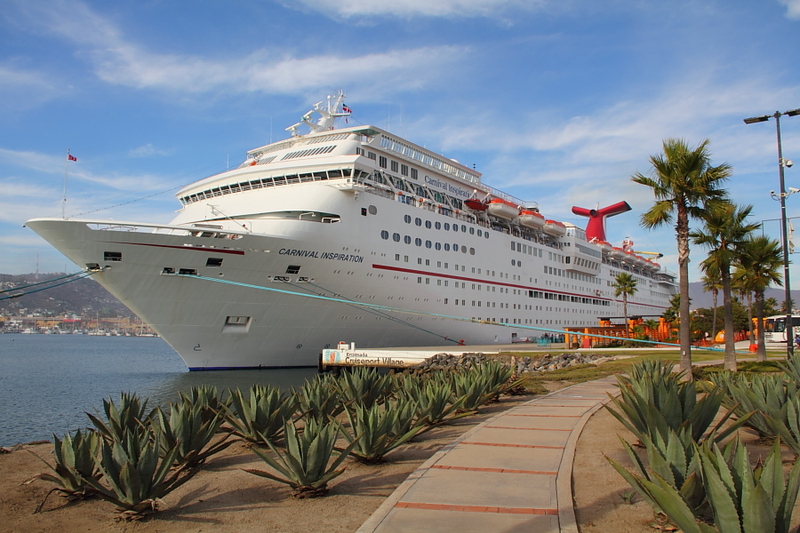 The Carnival Inspiration docked in Ensenada, Mexico. You might be surprised to learn that there's a lot to like about these older, smaller Fantasy-class ships. To see what advantages they have over the newer, larger ships... take a look at this page. 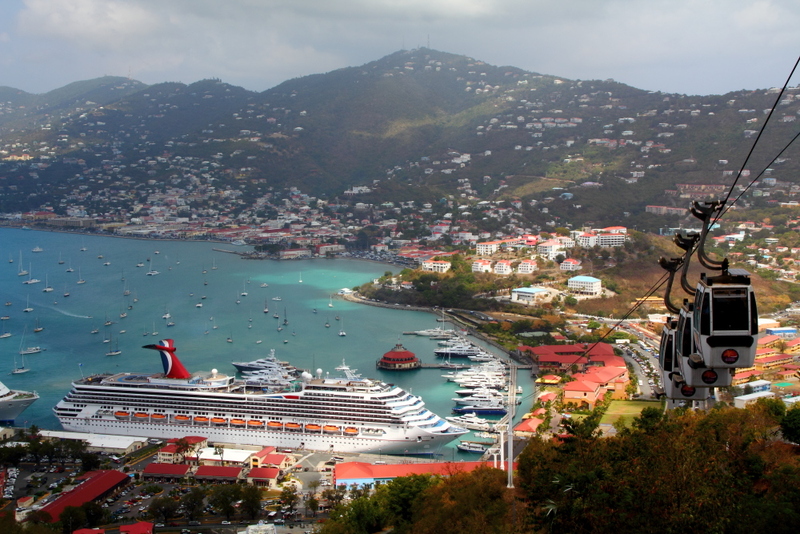 The Carnival Glory docked in St. Thomas. This photo was taken from Paradise Point. At home, the only comedians I ever see are on the television. On a Carnival cruise, they have a comedy club with four different comedians. 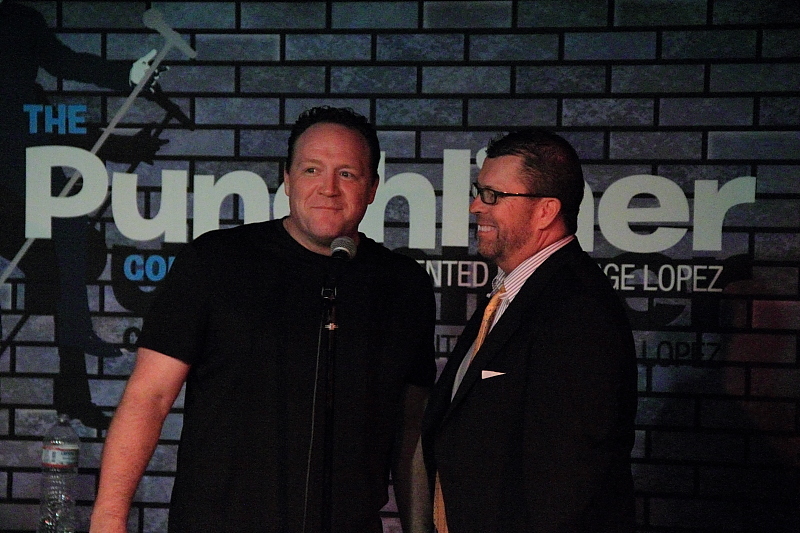 Comedian Lenny Schmidt (on the left) was hilarious on our 2012 Carnival Magic cruise. Besides all the fun to be had on the cruise ship itself, a great thing about cruising is all the fun you can have on shore. Here's my wife, Kellyn, enjoying one of her favorite shore excursions, ever! 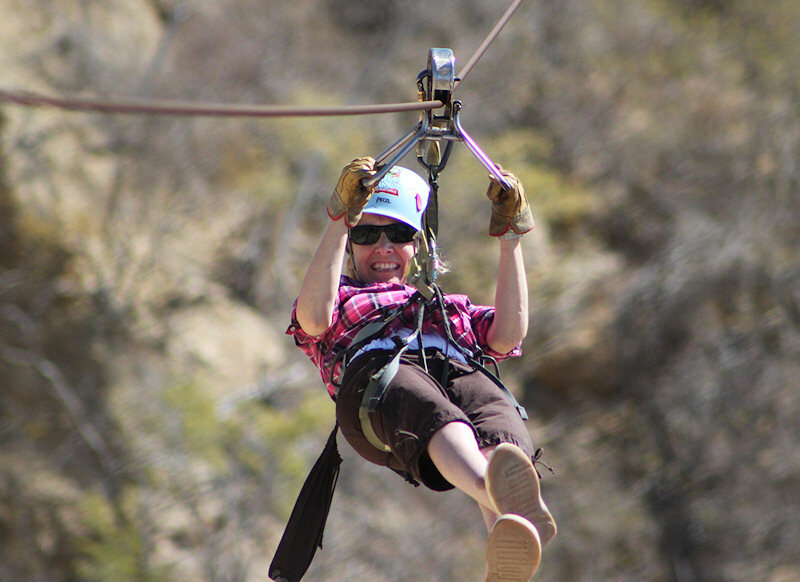 This is the zip line at Wild Canyon outside of Cabo San Lucas, Mexico. The nicest (and most expensive) cruise ship cabin we've experienced was the Captain's Suite on the Carnival Sunshine. This video tour gives you a great look at what was so special about that cabin. absolutely no desire to sail on that ship ever again! We weren't sure we were going to like Princess cruise line, so we booked a short cruise for our first Princess cruise. I really like this picture because it shows me in a 100% relaxed and happy state. Not a care in the world, and having fun in 80 degree water! We always book a balcony cabin, because we like to sit on the balcony and watch for marine life. 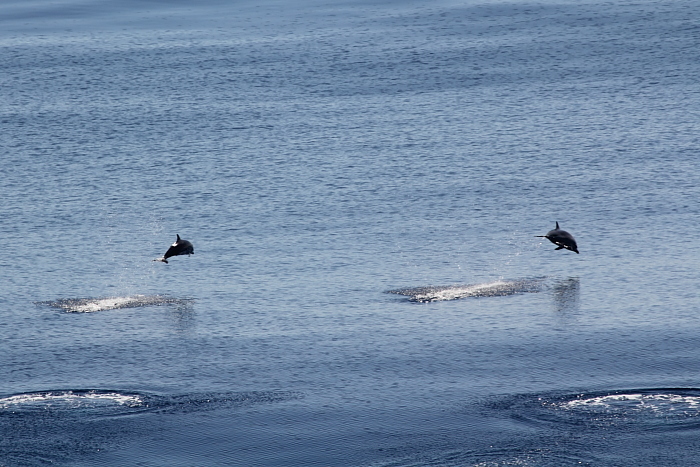 Here are some dolphins swimming near the Carnival Spirit in Manzanillo Bay. 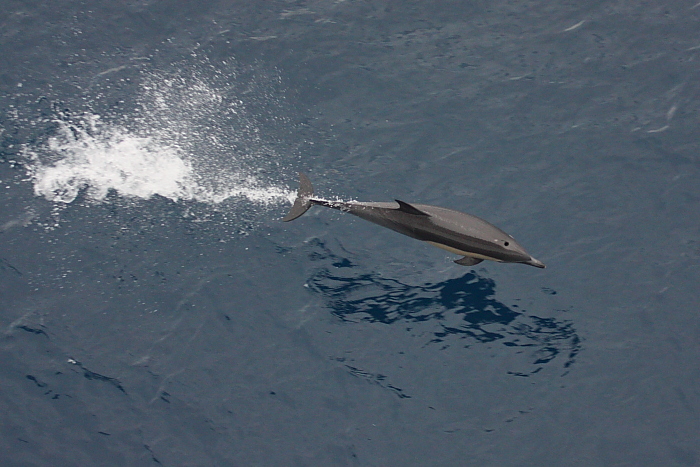 During a previous cruise, we had an even more amazing dolphin sighting! 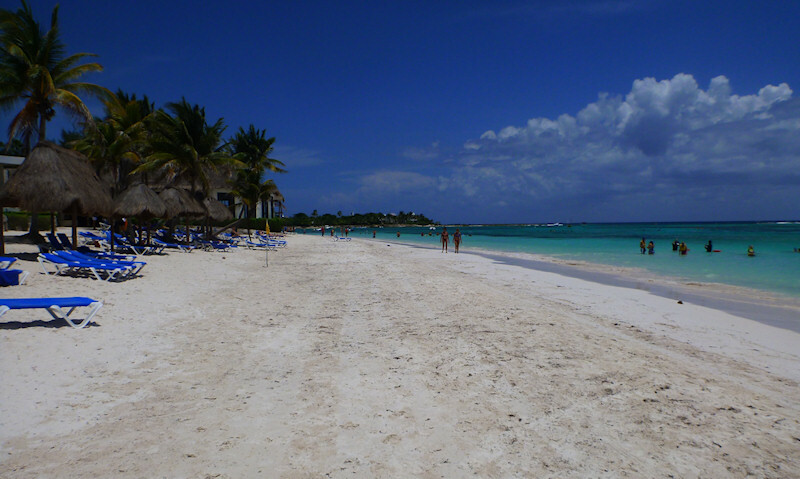 Akumal, Mexico... one of the most gorgeous places I've ever been. 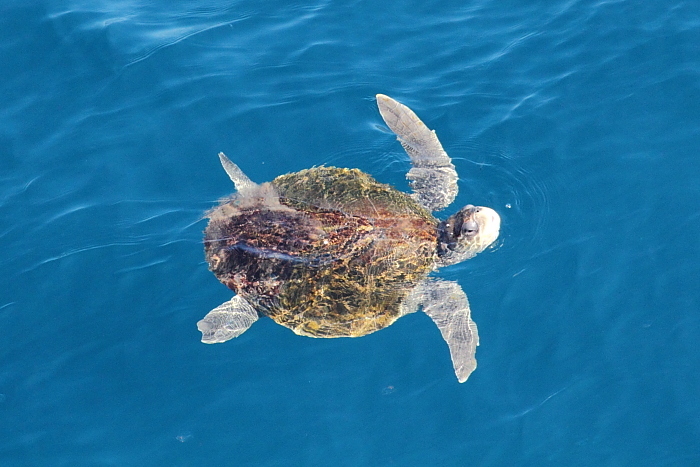 We snorkeled with gigantic wild sea turtles that graze on grass growing just a few feet offshore. 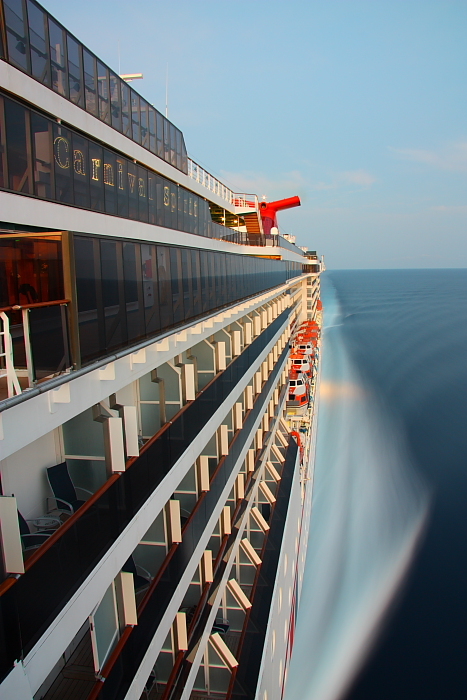 This is an interesting shot I took of the Carnival Spirit in the morning light. and I got this shot from the balcony of our hotel room as the Carnival Spirit docked just before sunrise. 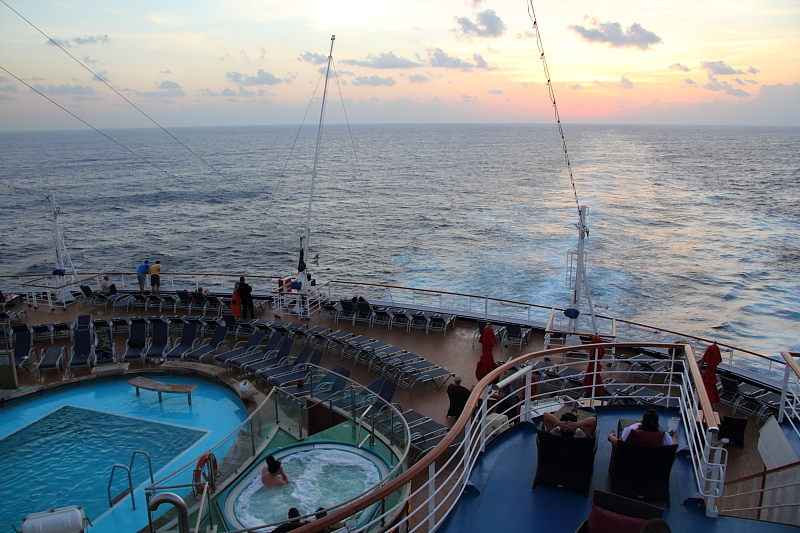 People watch the sun set in to the Caribbean from the back of the Carnival Magic. No set of Carnival cruise photos would be complete without a picture of a towel animal! The Carnival Spirit makes a quick stop for a medical evacuation off the coast of Cabo San Lucas. I took this shot from the balcony of our cabin on the Carnival Splendor. Looks like a post card, doesn't it? 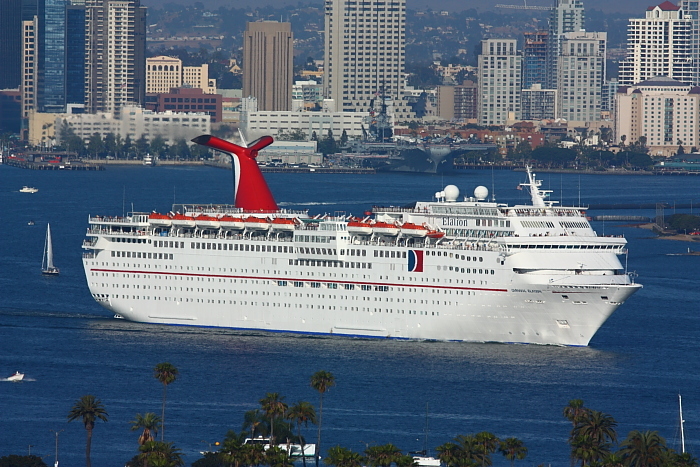 I took this photo of the Carnival Valor during our September 2011 cruise. The Carnival Splendor... docked in Mazatlan, Mexico. You may have heard about the incident in November of 2010 where fire struck the Splendor's engine room. We cruised on the Splendor about nine months prior to that incident. but on the Carnival Spirit, not on the Carnival Splendor. 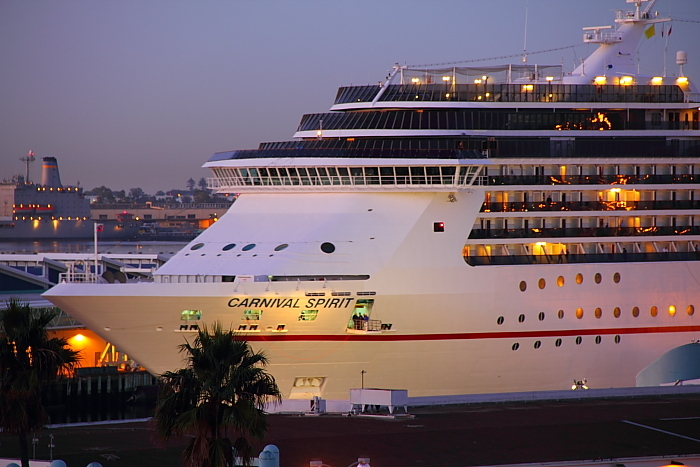 More pictures of the Carnival Splendor are here. 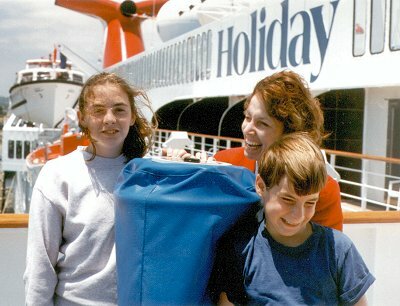 Our very first cruise was in 1996 on Carnival's "MS Holiday". I think we left the kids home for almost every other one of our cruises after this! Almost 18 years after that first cruise, my camera and Kellyn's hair style are both a lot better! A few years ago, when we were cruising the Mexican Riviera on the Carnival Spirit, I shot a video of people going down the ship's newest attraction... the Green Thunder waterslide. The Green Thunder slide had just been added to the ship... and at that time, no other cruise ship had anything like it. Instead of the traditional twister-slide design of most cruise ship waterslides, this one starts off with a straight-down vertical drop. You get in to a chamber, they close the door around you, and then the floor drops out from under you and you fall straight down. Scariest two seconds of your life! Then it turns in to a normal curvy waterslide and before you know it, you've splashed down in to the end of the ride. It's the craziest, scariest, and most-fun waterslide at sea! So, when I got home from that cruise on the Carnival Spirit... I edited together my little Green Thunder waterslide video, uploaded it to YouTube, and didn't give it another thought. To me, it was just another in a series of many cruise ship related videos I've posted to YouTube over the years. I literally forgot all about it and went on with my life for the next couple of months. Completely unknown to me at that time... the video went viral on YouTube! And I didn't even realize it. One day, a couple of months later, I was just goofing off at my computer and I decided to take a look at the statistics on my YouTube channel to see how many people had been watching my videos. Up until that point, 1,000 or 2,000 views would have been really good for one of my videos. Imagine my surprise -- no, that's not a strong enough word -- imagine my total SHOCK when I discovered that my Green Thunder waterslide video had over 2,000,000 views at that point! That's two million... and that's a LOT of views for a YouTube video. The first thing I did was to call my son, Jeff, to share the news. I knew that he's Internet savvy... and that he, of all people, would appreciate how amazing it is for a YouTube video to get two million views. His reaction, upon hearing the news, was that I absolutely must monetize it. Monetization on YouTube is the process of allowing them to run ads along with your videos. It can be either those ads, similar to a TV commercial, that run before your video plays... or it can be those little text or banner ads that are superimposed over the video as it runs. By allowing YouTube to run ads with your video... you earn a portion of the advertising revenue if someone watches a TV-style ad all the way through without skipping it, or if someone clicks on one of those text or banner ads. That's what monetization is. So, Jeff's immediate advice was that I had to monetize it... and I had actually realized that same thing for myself before I had even called him. Hearing him say it, too, gave me even more motivation. I didn't really have a clue what kind of advertising revenue we might be talking about... and I knew that I had really blown it by not monetizing it BEFORE the first two million views... but all I could do was to monetize it at that point and hope that two million views was just the beginning. And that's exactly what it was. Before I go any further with this story... let's take a look at my Green Thunder waterslide video... the one that went viral on YouTube. As it turns out, the first two million views were indeed just the tip of the iceberg. It boggles my mind to be able to say that my little video has now been viewed over 90 MILLION times on YouTube! Is that crazy, or what? Just to put that in to perspective... if you go to YouTube and do a search for "Carnival Cruise" and then sort them by the number of views, you'll find that my video is -- by a wide margin -- the most viewed YouTube video about a Carnival cruise that there is. In fact, don't just limit it to Carnival. Do a search for "cruise ship" and sort by number of views and you'll find that my little Green Thunder video is the #1 YouTube cruise ship video of them all! Now, let's discuss this a little, shall we? First off, you're probably wondering... have I made a ton of money off of it? The terms of my the monetization contract with YouTube forbid me from discussing the specifics of that aspect. Let's just say that I'm very happy with the advertising revenue. And yes, the IRS is, too. I'm certainly wondering if lightning can strike twice. In other words, can I come up with a second viral video? I keep trying! You just never know what's going to catch on. I personally think the second version of the water slide video is funnier than the first... so maybe it will catch on! I keep shooting videos during my vacations and posting the interesting ones to YouTube. As of this writing, I've got over 200 videos on my YouTube channel. Besides the one about the Green Thunder water slide, only one other video of mine has caught on in a big way. Oddly enough, it's also about a vertical-drop cruise ship water slide... the "Free Fall" slide on the Norwegian Getaway. Here's the video, which has been viewed over 10 million times! At the time I shot my viral video, it was the only slide of its kind on a cruise ship. But it's been so successful that Carnival added a Green Thunder slide to another one of their ships in 2014, and Norwegian Cruise Lines put vertical-drop waterslides of two of their ships. I'm looking forward to trying the Norwegian cruise line version later this year. Keeping an eye on the weather is an absolute must before and during a cruise vacation. To make it easier for me to find everything I needed all in one spot, I put a special weather page together. I really made it just for me, but if you've got a cruise coming up... you might find it useful, too. Check it out here. If you've never been on a cruise ship, you might be wondering what all the fuss is about. What's so great about cruising? Let me tell you! Great food, and plenty of it! If you like to eat, this is the vacation for you. There's food available at all times. Besides the main dining room and the casual buffet, there is also free 24/7 room service on Carnival. And free 24/7 soft-serve ice cream and frozen yogurt, too! Plenty of entertainment! At home, we just never go out to a comedy show, and rarely go out to listen to a singer or a band. On a 7-day Carnival cruise there will be shows by FOUR different comedians, plus a variety of musical acts, and several Broadway-style shows. There's also a variety of little things like trivia games, scavenger hunts, ice-carving demonstrations, and a hairy chest competition! Sunshine! During your normal life at home, how often do you take the time to go sit outside in a lounge chair and read a book? How often do you make it to the beach, or to a swimming pool? Warm weather, and warm water! The climate is very mild where I live. Daytime temperatures here are mostly in the 60's and 70's. While we live only a short distance from the beach, swimming in the ocean is out of the question... the water temperature is in the 50's. I wouldn't want to live somewhere where it was hot every day... but for a week or two, it's a welcome change! And being able to swim in 70-80 degree ocean water is my idea of paradise! No chores! A cabin steward cleans my room, changes my sheets, and cleans my toilet. A kitchen staff cooks for me, and does the dishes. This really IS paradise! No allergies! I'm super allergic to mold... and I think there must be some in my house somewhere. I'm always fighting allergies here at home. But not on a cruise ship! Wow, do my allergies clear up once a cruise begins. I guess it makes sense... out on the open ocean, where would mold and pollen come from? And you know what else you don't have when you're sitting in a chair on your balcony on a cruise? Flies, mosquitos, and gnats. Spend some time with the one that you love! There's nothing like being together for a 7-day cruise to foster some good communication and some good times between two people that love each other. And in those rare cases where a certain someone gets on your nerves... it's a big ship... take a walk! Cheap vacation, if you want it to be! 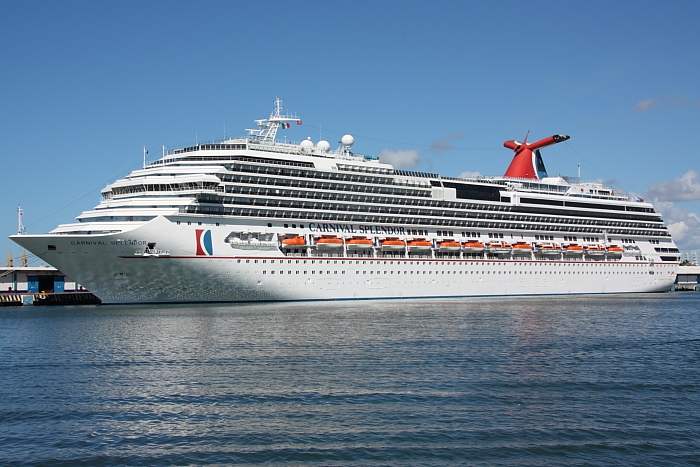 More so than any other cruise line, cruising with Carnival is extremely affordable. If you compare a Disney cruise to a Carnival cruise, you'll find the comparable cabin on a comparable Carnival cruise is about half the price. Compare to Royal Caribbean Cruise Line and you'll find Carnival is usually at least several hundred dollars cheaper. And if you're on a super tight budget, there are ways to keep the price of a Carnival cruise incredibly low. My son and his girlfriend have booked a 7-day Carnival cruise for $700... and that's not $700 each, that's $700 for the two of them! They did this by booking the cruise well in advance... by cruising during a month where demand for cruises is low... and by booking an interior cabin (in other words, no windows) on the lowest deck of the ship. They like having no windows in their cabin, because they like to sleep late in the morning and with no windows you have no sun waking you up at the crack of dawn. And remember... on a cruise, all your meals are included... so you don't have to set aside any extra money in the vacation budget for that. A great way to vacation with family and friends! It's fun to go cruising with people you know... even if some of them are people you only want to spend a little bit of time with, not a lot. You all have so many options on a cruise vacation that you can choose to spend as much or as little time together as you want. Do your own thing and meet up for a meal or two... or spend every minute of the day together, if you want to. There's so much flexibility on a cruise! See the world! In fact, see multiple parts of the world all in one week. I had no idea Acapulco Bay was so beautiful until I cruised in to it. 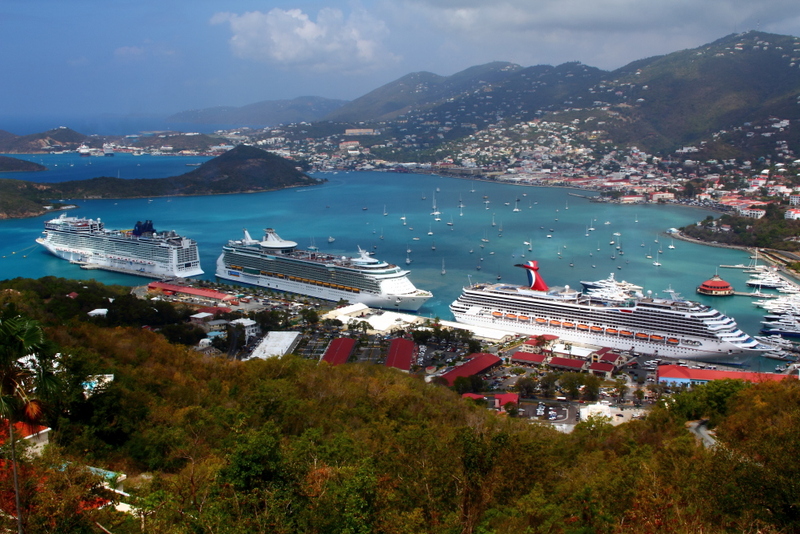 I had never been to the Caribbean until a cruise ship took me there. Before cruising, all I had ever seen of Mexico was Tijuana and Ensenada... and they aren't very impressive! But once I cruised to Cozumel, Ixtapa, Puerto Vallarta... I suddenly got a look at the best of Mexico. I had no idea that one of the greatest barrier reefs for snorkeling is off the coast of Honduras, until I cruised there. And who would have thought that I would have so much fun in the Cayman Islands, or on the island of Roatan? I had no idea what those places were about until a cruise ship took me there. Now I admit, cruise ships typically only spend 8 or maybe 12 hours in any particular port... so you only get a small taste of life in each of these places. But if you want to spend more time there, you can either cruise back there again sometime... or if you totally fall in love with a place, you can fly there some other time for a traditional vacation. About a mile off shore of Cabo San Lucas, during a cruise on the Carnival Splendor. 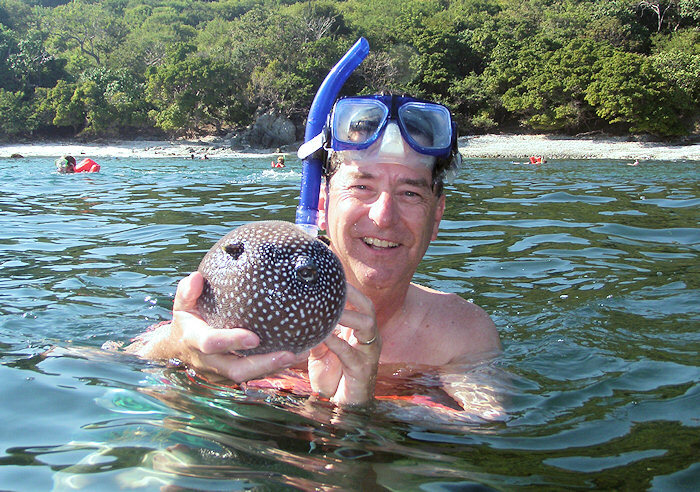 Here I am holding a puffer fish near Zihuatanejo, Mexico, during a cruise on the Carnival Spirit. We had a couple of great cruises to Acapulco, and always saw turtles in the water once we got within about a day of reaching Acapulco. 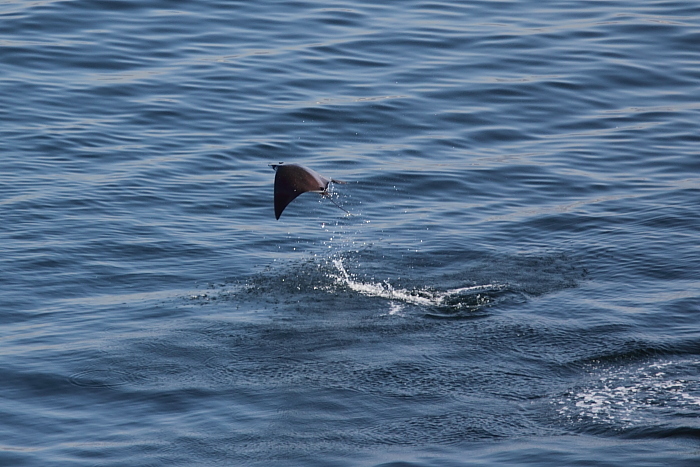 We were just sitting out on our balcony, anchored off Manzanillo, when this sting ray started flying out of the water over and over again. 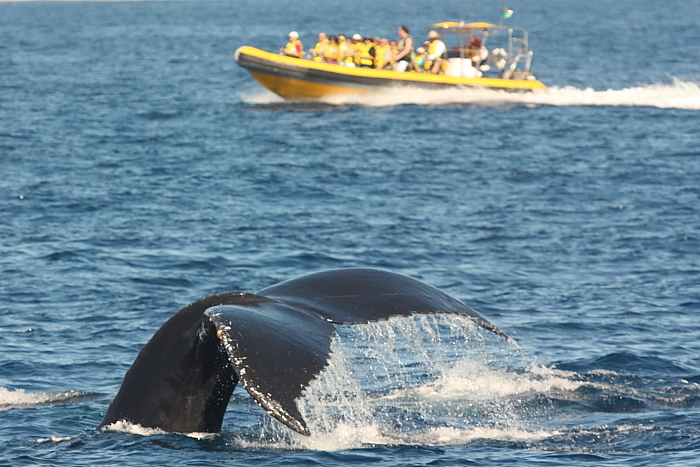 considering how many we had seen in our multiple cruises to the west coast of Mexico. 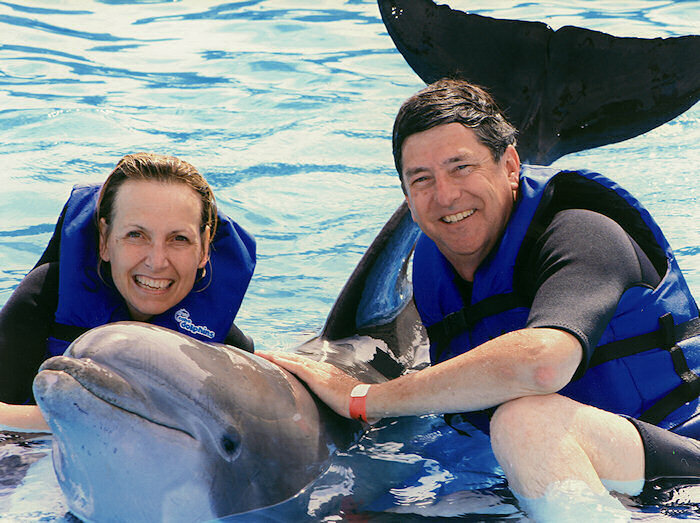 If you really like dolphins a lot, there are quite a few places you can go to spend some time up close with them. 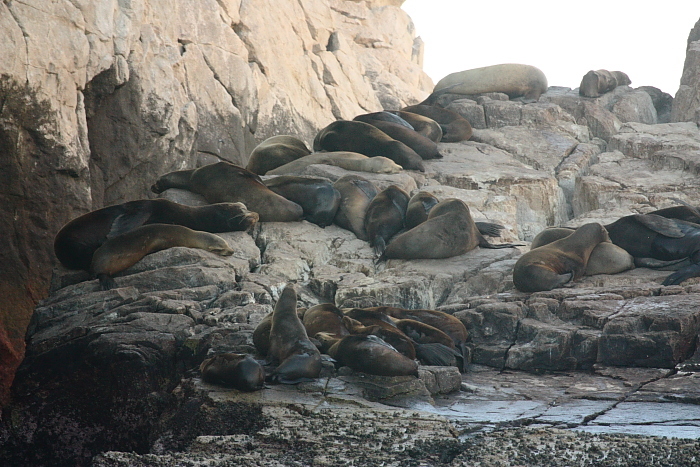 A colony of seals near Lovers Beach in Cabo San Lucas. 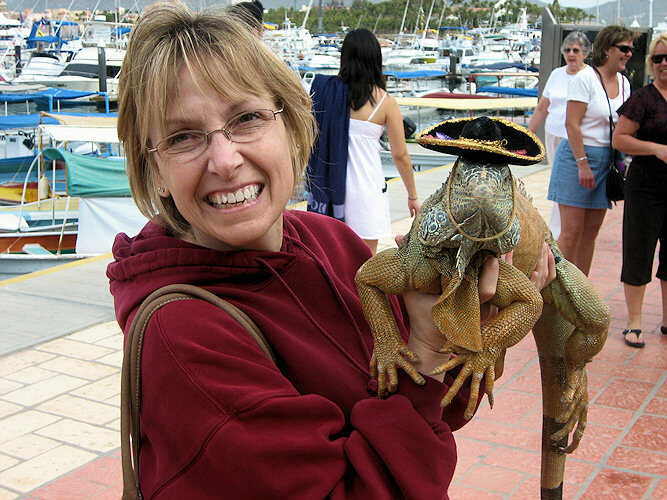 In several ports of call, we have seen photo opportunities with iguanas. 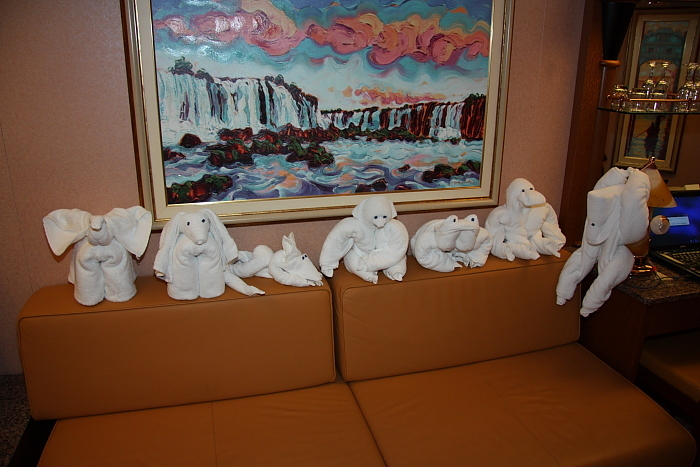 Speaking of wild life, don't forget the towel animals that your cabin steward makes for you each evening. We save them, so that by the end of the cruise we have a whole menagerie. Sometimes people make a funny face when we're talking about cruising and I mention that Carnival is my favorite cruise line. It seems that Carnival has a bit of a bad reputation out there... but I suspect that's mainly among people who have never actually been on a Carnival cruise! We've been on twenty Carnival cruises, and they have never let us down. Every cruise has been fun, memorable, and a very good value. There are a lot of cruise lines to choose from... but Carnival is a little different than the others in a few respects. First off, the pricing is tremendous. If you compare a Carnival cruise to a comparable cruise on just about any other cruise line, the Carnival cruise is going to be less expensive. And on top of that, the other cruise lines charge extra for some things that are totally free on Carnival. As an example... compare the high-end burger joints on Carnival versus Royal Caribbean. On RCCL, they have "Johnny Rockets"... on Carnival it's "Guy's Burger Joint". The big difference is that you can eat at Guy's Burger Joint at no extra charge. Another thing about Carnival is that they put a big emphasis on FUN. They don't call them the Fun Ships for nothing! Take a look at this video I shot on a "Fun Day At Sea" on a Carnival Ship, and then think about cruising with a bunch of 80-year-olds on Holland America Lines!